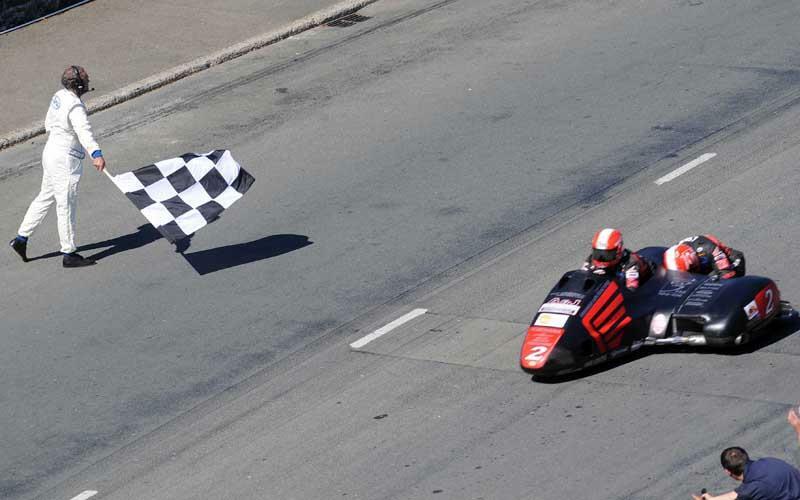 Nick Crowe and Mark Cox have secured their second sidecar win of the Isle of Man TT this afternoon after a great battle with second placed Dave Molyneux and Dan Sayle. The two Isle of Man riders stuck together throughout most of the three laps of the 37.73 Mountain Course. There were no records broken for times or speed as the riders and passengers battled with the win, which was playing havoc with their grounding. Molyneux and Sayle were first out on the Mountain Course and were first to appear at Glen Helen, but Nick Crowe and Mark Cox were already leading at the first time zone on time correction. Molyneux, who retired at the end of the pit lane on Saturday, was actually third at Glen Helen, but by Ballaugh Bridge he had grabbed back some vital seconds to move up to second which is where the DMR Suzuki pair stayed. Half way round the lap Crowe had the LCR Honda 6.44secs ahead of Molyneux on time and by the end of the lap he was 10 seconds in the lead after recording a lap of 114.300mph with a time of 19:48.35. On lap two Crowe had got ahead of Molyneux on the road as well as with the times which then spurred Molyneux and Sayle on to keep within the reach of Crowe / Cox. At Ballaugh Bridge Steve Norbury and Rick Long were up to fourth with John Holden and Andrew Winkle in a secure third. Towards the end of the lap World Champions Tim Reeves and Patrick Farrance had put their LCR Suzuki into sixth while the leaders continued to push on recording a 19:45.81 lap on the second circuit. And with Crowe retaining a 10 second advantage on the clocks, all that remained was for the spectators to enjoy the battle on the tarmac as the two motorbikes were neck and neck. But the places were decided and Crowe and Cox took their second win of the week and Crowe’s fifth Isle of Man TT Sidecar win of his career. After the race Crowe said: We had a good time up there, me and Dave (Molyneux) rode our arses off. I think we were even touching at times, I’m made up. Cox added: “It was awesome, better than the first. “Dave (Molyneux) pushed us all the way. Water started pouring out on the second lap and I was just praying that it would hold out. World Sidecar Champions Tim Reeves and Patrick Farrance had another good race, finishing in sixth.